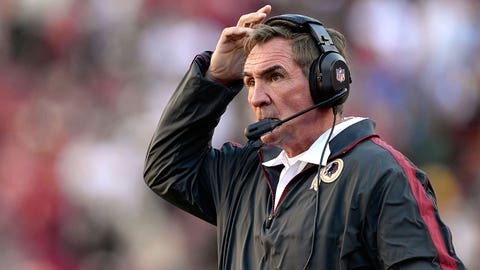 If money talks, then it may be awhile before Mike Shanahan walks. That’s the takeaway from a report sizing up Shanahan’s future — or lack thereof — as coach of the Washington Redskins. When he announced Wednesday that Kirk Cousins would start at quarterback in place of Robert Griffin III, Shanahan said he wouldn’t have made the decision if he didn’t have the approval of owner Daniel Snyder and GM Bruce Allen, The Washington Post reported. The paper said sources confirmed Snyder did not object to the change, with indications the owner felt the matter was Shanahan’s responsibility and that he should not intervene. But that’s where the backstory kicks in. There has been speculation recently that Shanahan, whose relationship with neither Snyder nor franchise cornerstone Griffin is considered strong, wants out of Washington. In a perfect world, coach and front office could agree to disagree and reach an agreement to make the problem go away by letting the coach go away. But multiple people close to the matter told the paper Snyder has been unwilling to pay the full amount he would owe Shanahan and his coaching staff if he fired them. And that’s where the quarterback roulette becomes more complicated than merely a decision to showcase Cousins as a prelude to a trade for much-needed draft picks. The paper reported it is believed Shanahan’s contract gives him full control over personnel decisions — such as picking the quarterback. The sources said it was not clear whether Shanahan’s contract was a factor, but it’s possible Snyder did not want to be found in violation of it by blocking the quarterback change. If he’s fired and the coaching staff is purged along with Shanahan, Snyder would be left holding the bag on about $13 million in contracts. So if Snyder isn’t willing to pay the full sum and Shanahan isn’t going to walk away without getting paid, the $64,000 question becomes how much is enough to send everyone away satisfied at the end of the season.